When I began this series a few months ago, my intent was to focus on the spiritual battle that takes place in my mind. I truly believe that spiritual warfare begins in the mind. It is imperative for you as a devoted Christian to guard your heart and mind against the schemes of the enemy. I was surprised by the number of responses to determined courage. I believe the need for courage is often forgot about. It is a necessity for every Christian as we seek to live for Christ and glorify our Father in Heaven. A devoted Christian realizes that without Christ, they can do nothing. Every breath you breathe is because God allows. However, it is easy at times to get caught up trying to do things in your own strength. Many times it takes moments of adversity, pain, and challenges to remind you of your dependency on Christ. Our culture today lauds over the self-sufficient person, self starters, and innovators, but without Christ’s empowering you to accomplish His will, you are just chasing your tail. The devoted Christian realizes who they are in Christ, and seeks His strength to glorify Him. A word of caution here. This verse in Philippians is not giving you carte blanche to do whatever you “feel” and asking God to bless it. It is a encouraging reminder that God will empower you to accomplish His will. This involves a willingness to obey God’s direction. God knows your heart and when you humble yourself while recognizing your complete dependence on Him, He will reveal Himself in ways beyond what you can imagine! Dependence requires trust. You must trust God wholeheartedly. Whether that means stepping outside your comfort zone to follow His leading or waiting for His direction. Prayer…where do I begin? I have seen the power of prayer in my life firsthand. I’m not sure where I would be without the influence of prayer in my life. That does not mean my life is easy…far from it. It’s nothing short of a miracle that I’m able to sit here writing to you now. Since my stroke in 2010, I have begun to realize what a privilege and opportunity it is to talk with God. Talking with God should be second nature for the devoted Christian. Whether it be praising Him in the morning as the sun kisses your face on your morning walk, or thanking Him for revealing new insights while reading a scripture you’ve read many times before. Most importantly, He has saved your soul for eternity. Think on that for a minute! How can you not make it a priority to constantly converse with your Savior? God is longing to hear from you…have you talked with Him today? I find myself talking with God throughout the day. I cherish every morning I awake. I thank Him for His provision and protection. I thank Him for my family who continues to love and support me. Prayer is a privilege that was paid for with the blood of Jesus Christ. Get intimate with God and talk with Him…you can talk about anything with God. You will begin to hear from Him as you seek Him with all your heart. As I mentioned in my book, Unleash the Power of Prayer in your Life, “Prayer is the conduit by which we can access God’s power.” The devoted Christian’s prayer life grows deeper as you begin to realize the necessity of talking with God on a regular basis. This leads me to the final evidence that I want to share with you. This final evidence for me is very personal. It was during my stroke recovery in the hospital that God revealed to me His purpose for my salvation. It was not just for me to stay out of Hell, It was so much more. God desires us a Christians to live a life so that He is glorified. He wants us to share the gospel of Christ, and to encourage our brothers and sisters in Christ. We do this while showing a love like He has shown to you and me not expecting anything in return. Wow, how powerful is that? You have been created to serve the Lord! Embrace this honor and serve Him with gladness. (Psalm 100:2) Let those who come in contact with you see the divine evidence that you belong to Christ. I know I covered a lot of ground in this series, but I wanted to share with you what God has crystallized for me regarding my life as a man of God. These evidences don’t take place overnight but should become evident over time. It’s up to you to make a commitment to glorify Him in everything you do. So as you walk the Christian life each day, I want you to remember this. It is vitally important to immerse yourself in God’s word and have those truths at the ready in your mind. There is a spiritual battle taking place every day and no one is immune to it at all! God has left for you everything you need to defeat those strongholds that can strangle your testimony for Him. Fear, doubt worry, etc… Ask yourself, are there evidences that have become invisible for people to see? It can be beyond difficult at times, but living as a devoted Christian was not intended to be easy. Christ has paid the price. Now, will you make it a priority to honor and glorify Him? Think on this as you live each day. "Horace Williams, Jr.'s non-fiction Christian Worship and Prayer book, Unleash the Power of Prayer in Your Life: A Power that Transforms Lives, briefly and eloquently explores the benefits of prayer and the richness of having a personal relationship with God. Williams answers many questions in his book, including what prayer is, when and how often should one pray and how forgiveness impacts one's relationship with God. 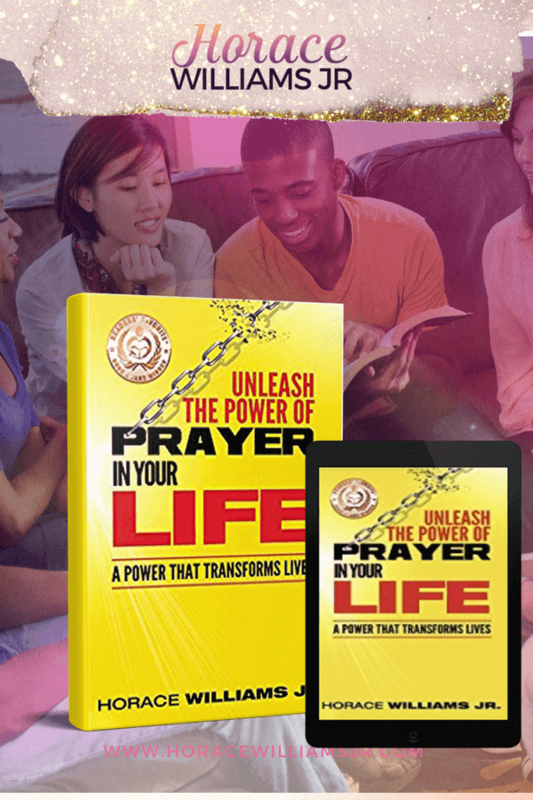 Each chapter in his book addresses a power imparted through and by prayer, Unleash the Power of Prayer in Your Life: A Power that Transforms Lives is most highly recommended." Now available on Amazon. Get your copy today. God, my word from You in the New Year is what?! Horace, I so appreciate the depth here and your calling to lead people to deeper commitment and growth! I think the first is the hardest…dying to self! So glad you are sharing this here for the community to be encouraged also. Merry Christmas to you!! Thank you Crystal for the opportunity to share. It is such a blessing to have you visit here today. I’m so glad you enjoyed the thoughts shared here. I hope you have a wonderful Christmas and may God bless you and yours in the New Year. Love this encouragement to go deeper with God, Horace. Thank you for the prompt to look at what I’m doing in my strength. Praying this marks my life: “The devoted Christian realizes who they are in Christ, and seeks His strength to glorify Him.” Blessings to you, sweet friend. So glad you enjoyed this Crystal. One of the most important realizations as a result of my stroke is my dependence on God. He continues to heal and strengthen both my physical and spiritual body. I thank Him every day for His unconditional love. His strength carries me through whatever I might face. Thank you for stopping by. I hope you have a wonderful Christmas season and may God bless you and yours in the New Year. Amen, Amen, Amen! I need to remember I can’t do anything without Jesus. He is the reason I am able to do what I do, not my own strength. I so want to be a dependable servant! One who will finish what the Lord shows me to start. (That is something I’m working on at the moment.) Thank you for this series, Horace, it has blessed my heart. I’m thrilled to read that this post was uplifting to you Lori. I thank God for His persistent and sometimes painful reminders of my dependence on Him. His faithfulness is overwhelming and lifts my spirits every day. Thanks for stopping by dear friend. Have a fantastic weekend and may God continue to bless you and your family this Christmas season. Hi Horace, This looks like such a great series. I love how you help disciple believers into a deeper relationship with the Lord! Dependence is such a great word because it requires a deep relational trust with our Savior. Merry Christmas, Horace! Merry Christmas to you and yours Valerie. A dependence on Christ has such great meaning to me at this stage of my life. For years I took for granted the intimate relationship that God desires to have with me. I hope to impress on my fellow followers of Christ, the necessity to develop that intimacy. Always a blessing to hear from you my friend. Thank you for your support and encouragement. Have a fantastic weekend and may God continue to bless you and your family. Dependence is a word that keeps coming up as I listen to God today, Horace. And now I find it again here. God must be telling me something! I want to depend on him more and more. I need him for everything. Have a blessed Christmas season, friend! I hear you Lisa, and thanks for visiting. Yes, dependence is something God continues to develop in my relationship with Christ. I’m thankful for His patience with me as I seek to lean into Him. Always great to hear from you Lisa. Have a fantastic week and God bless you and yours, friend. Continue this good work in His name, my brother. Our father has called you and you have obeyed. fight the good fight and greater things he will reveal. Your message has inspired many this I know. Looking forward to a great relationship in his work. God richly bless you and yours at this time. Thank you for visiting Geoffrey. I thank God for the opportunity to share my testimony of faith. It’s my prayer to encourage my brothers and sisters in Christ, I want to help people know God as their as their Savior. Have a wonderful weekend and God bless you and yours. I LOVE these scriptures and they came at such a time that I needed them. Thank you. Thanks for the visit Meghan. God knows what we need, and exactly when we need it. Thankful for His perfect timing. Be well and God bless.